I have had this kit in the stash for some time now and with the recent articles about the Bullitt Mustang now in print and the hero car being found on in Tennessee as well as the jump car being found in Mexico, I was influenced to build mine now. I am starting with the Revell Bullitt 1968 Mustang GT kit 85-4233. 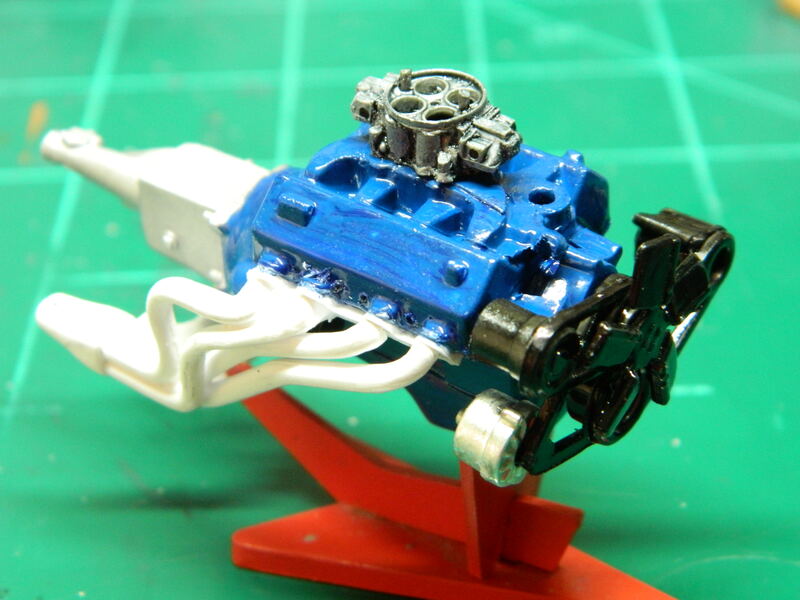 I also have the Revell '68 Mustang GT kit 85-4215 that I will use the Cobra Jet headers from. 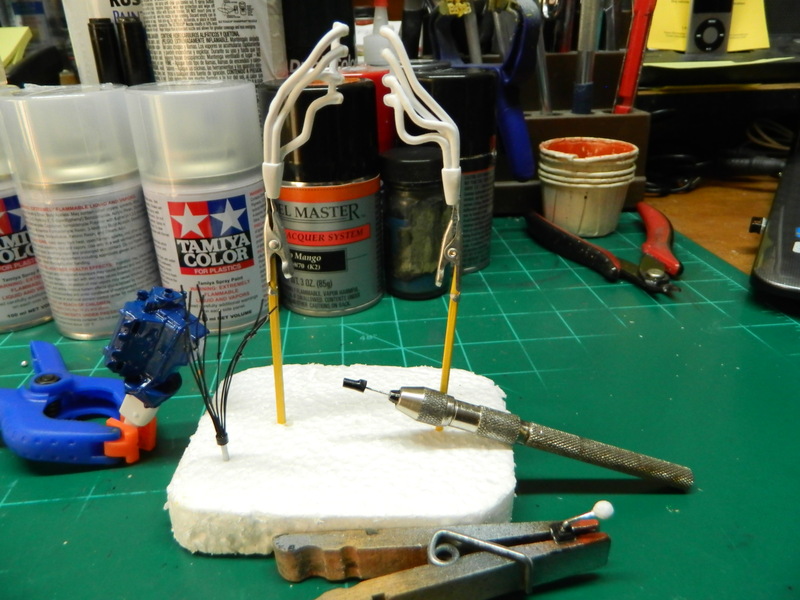 I will be following the build by Marcos Cruz for mine. I will eliminate the metal axles from this kit, close the gap in the engine bay to the front fenders, and try to find a close paint color match. 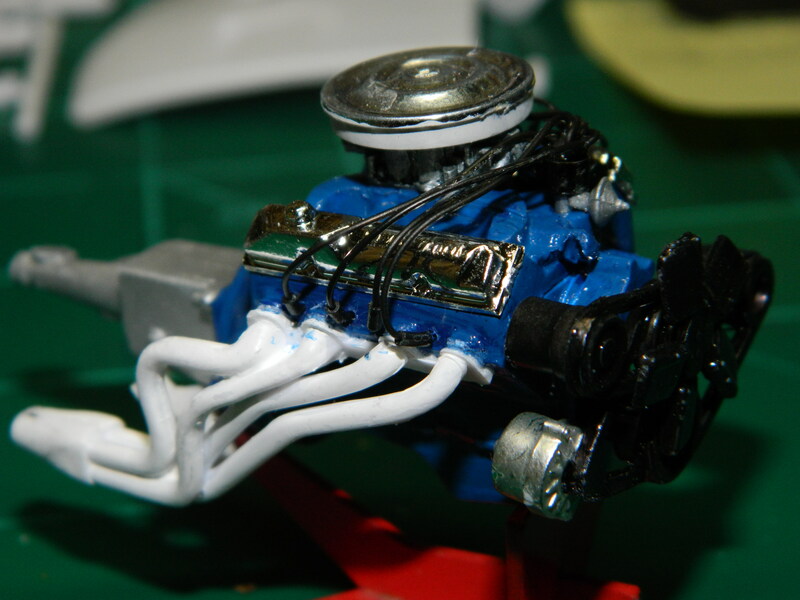 I started assembling the engine and the headers. 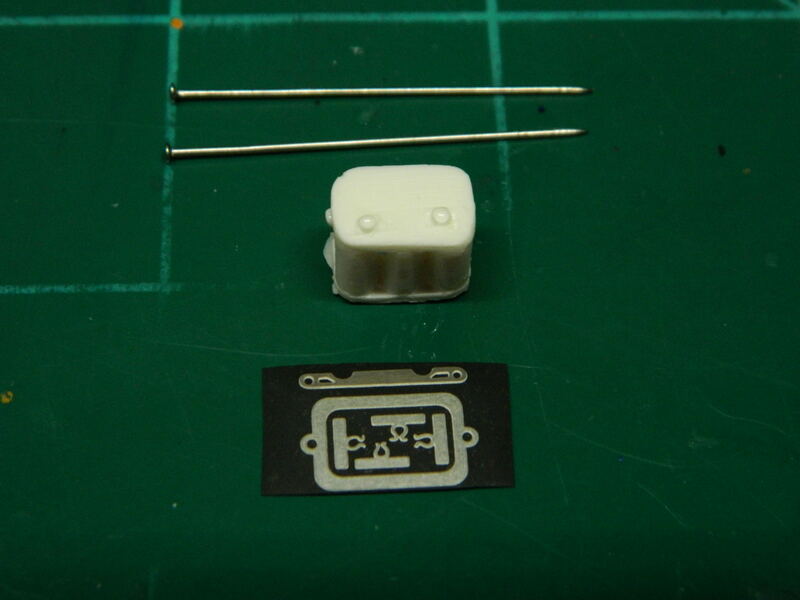 I'll wire the engine and I'll rummage through my parts box for a separate carb and an open element air cleaner. 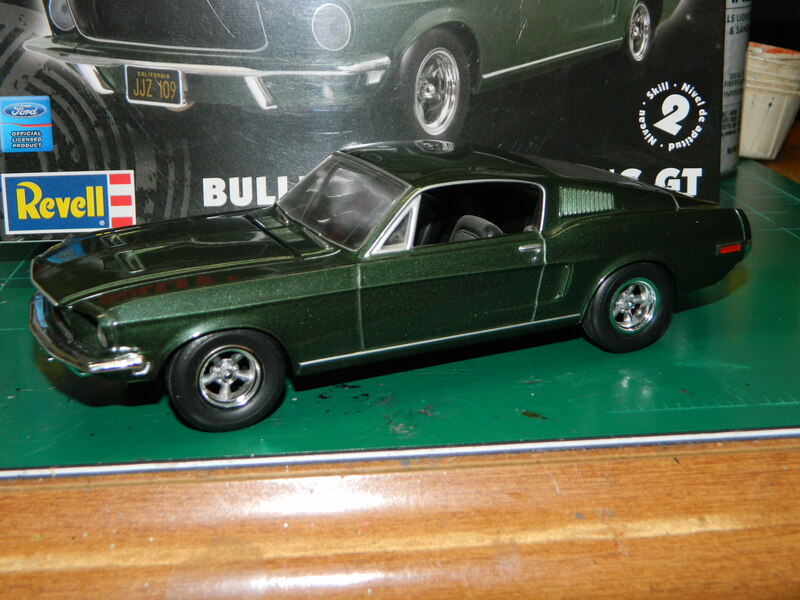 This is a diecast Revell Bullitt Mustang that I built many years ago. 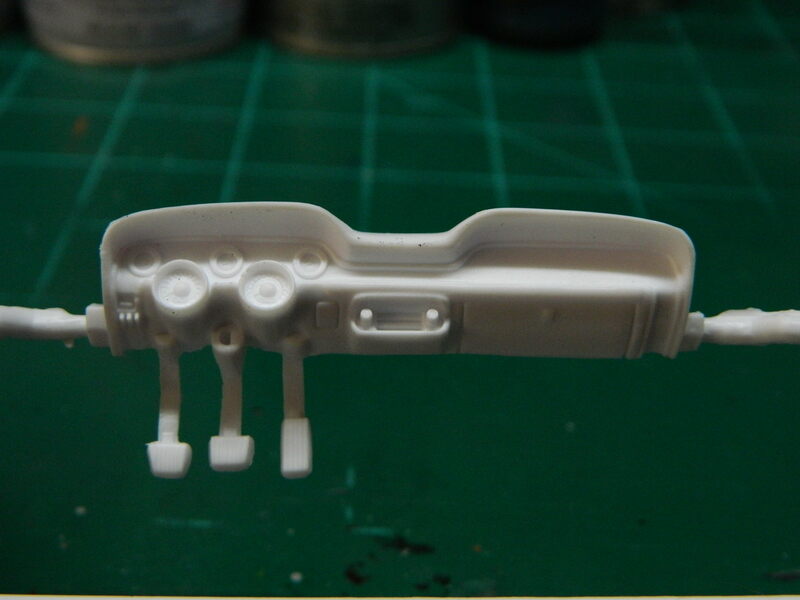 This came from the same molds that Revell used for the plastic version that I am about to build. As the market changed, Revell converted many of their diecast molds to plastic and this is one of them. The only change I can find is to the dash. The current version has two gauges mounted under the dash and my diecast version does not have them. I'm surprised that no one has built a '68 Charger R/T from the Revell '68 Charger kit and yes, I have the diecast version of that car, too! Just noticed your post on the Bullitt Mustang and wanted to ask a couple of questions. You said that you liked the Marcus Cruz car on the cover of Scale Auto and I noticed that wheels and tires seem to 'make' the car with the way it sits. Do you already have the wheels and tires you're going to use or would like to look through my 'boxes' of tires when you next come here? Also, I have quite a few sets of the 'mag' wheels from the Revell '32 Ford kits which look like they would work well on this car if you need some. Wouldn't the color I used on my Corvette work for this car? It's testors lacquer System Emerald Green. I could bring the 'Vette to the meeting Saturday if you'd like to take a look at it to see it once again. Just thought I'd mention this 'stuff' to you. The paint color will be the next thing I need to tackle. I have several metallic greens in my paint stash and I'll start looking at what color comes close to Highland Green Metallic. Like I have said previously, I'll buy from the internet as a last resort. I'm surprised that Highland Green Metallic is not produced as a hobby paint. Maybe Ford won't license it since it could be a big moneymaker for them? I don't know. I think the Emerald Green maybe a bit too dark or not the right shade for Highland Green Metallic. This is what I want to look into. There is no need to bring the 'Vette to the meeting unless you want to show it off to the Club. I have a can of Dupli-Color Emerald Green in my stash as well as two cans of Fathom Green (a good candidate). Where are my plastic spoons?!!! Thanks for the offers, Barry! I appreciate it! See you Saturday at the meeting! I have this kit and I built the die-cast it was based on. 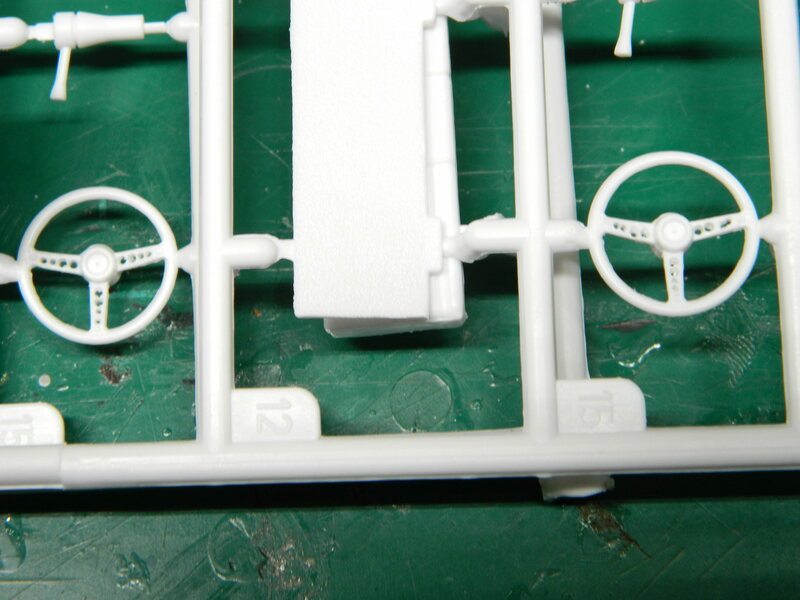 The one thing that bothered me about the die-cast (built it out of box) and was not addressed in the plastic kit, is no representation of brakes. The wide spokes make it easy to see that they are missing. The cover of the recent Scale Auto shows these as well on Marcus' beautiful presentation. He didn't address the missing brakes either. When, or if I get to this kit before I die (too many kits) I will put a disc or something to represent brakes. "Before they invented drawing boards, what did they go back to?" George Carlin On the bench: Could be anything, I have so many things started and put away I don't even know what I'll pick next. Hopefully, we can all build as many models before we all head for that great hobby shop in the sky. I for one, hope that I can! 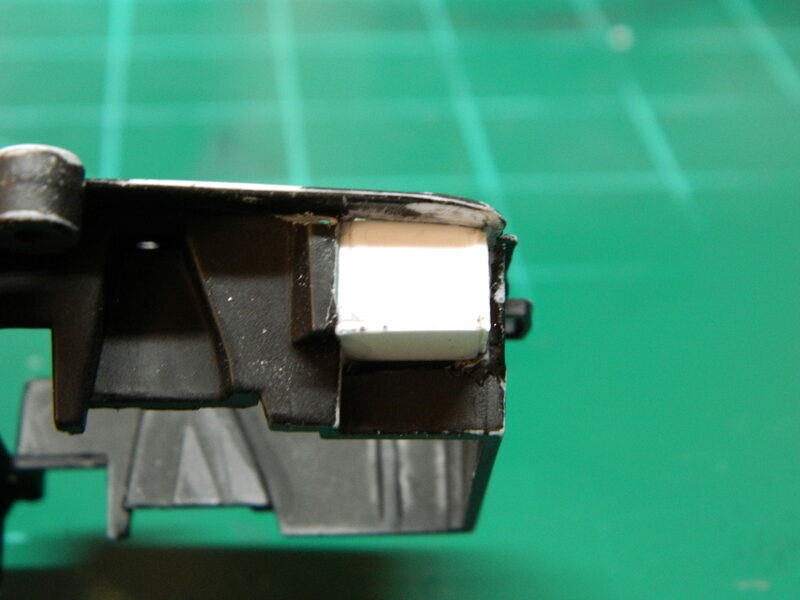 I had noticed the lack of brakes on Marcos model and the plastic Bullitt kit is no exception. Making brake discs or even some sort of drum brake backing disc would be a fairly easy chore to accomplish. 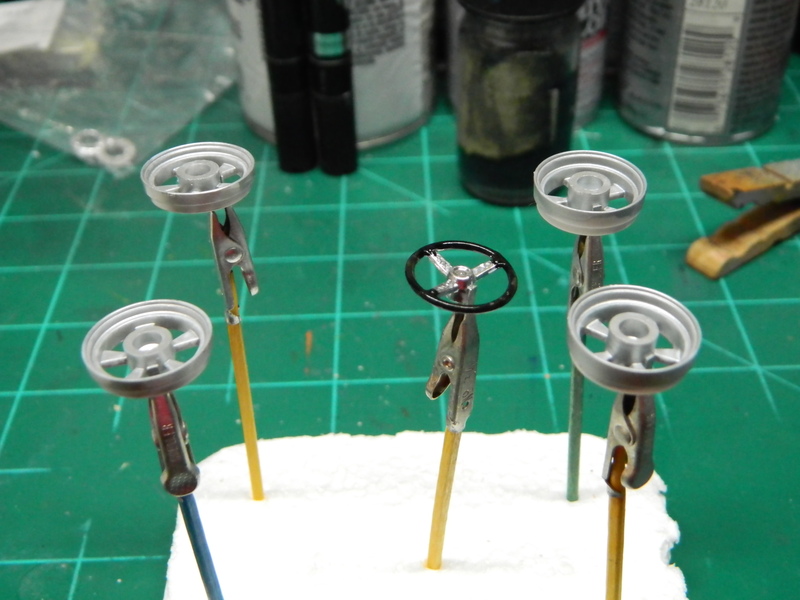 I also have a set of Pegasus unpainted disc brake rotors and caliphers that I could add to this kit. Mrmike, you're the man! I am at the first steps of my Bullitt Mustang project, and I was going to post questions - so now that I see your thread, could I have a few questions and comments. First, I've done my homework, and did a search in the forum here and another site about kit options and problems. I found your reply to a post from Feb 2013 for example. 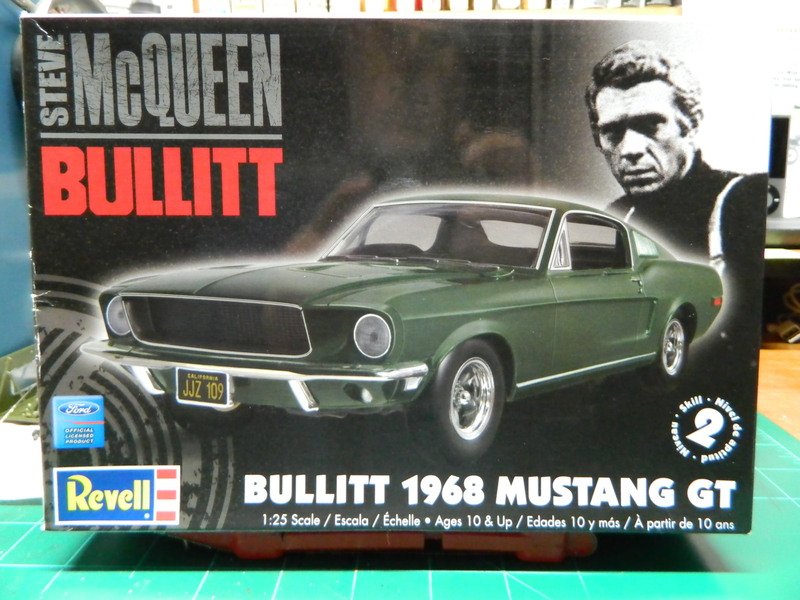 I concluded that a '68 Bullitt Mustang can be built out of both Revell plastic kits you mention at the beginning of this post: Revell Bullitt 1968 Mustang GT kit 85-4233 or Revell '68 Mustang GT kit 85-4215. The point of this question is that the second kit is easier / a lot cheaper to get (especially here, overseas from you). Did I get this right? The first kit, although the designated Bullitt kit, has its flaws as a former die-cast, plus incorrect wheel arches, hump in the roofline - as described by forum members earlier. The second kit (as I read) has the Bullitt grille and wheels, but no JJZ-109 licence plates of course, and incorrect '67 rear seat backs with horizontal ribs (maybe this goes for both kits - I haven't got mine in the mail yet). Apparently both kits have the corrected interior by now or if they are older issues, they can be ordered free from Revell (even here). I also wanted to ask, if you think it would be worth for me to order this current issue of the mag just for the Cruz article (shipped here overseas for $$s...) after reading all the build threads I found. What do you think about these paints? Wow Csaba! A loaded reply! 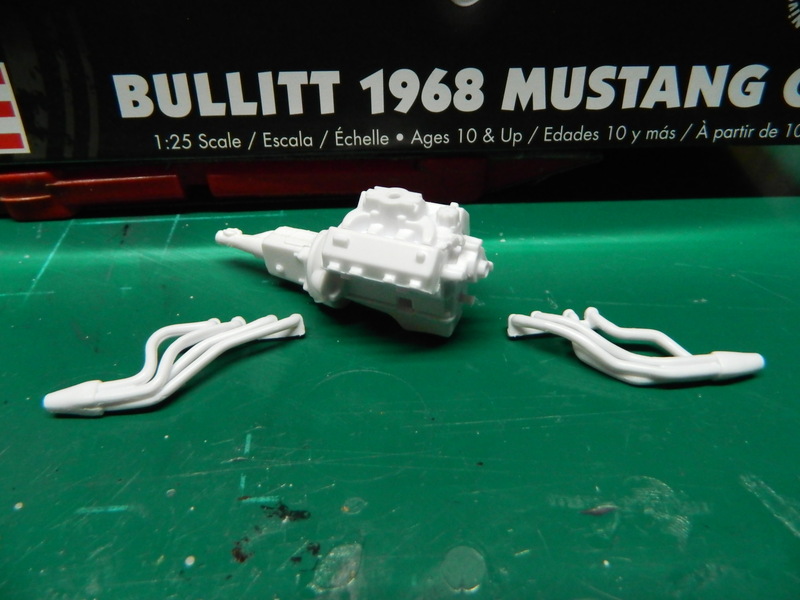 I will start here-both the Bullitt and the Mustang 2 'in 1 kits are from the same basic mold. The 2 'in 1 kit has two versions plus parts for the Bullitt kit as well. Those parts are the wheels and the grille insert. 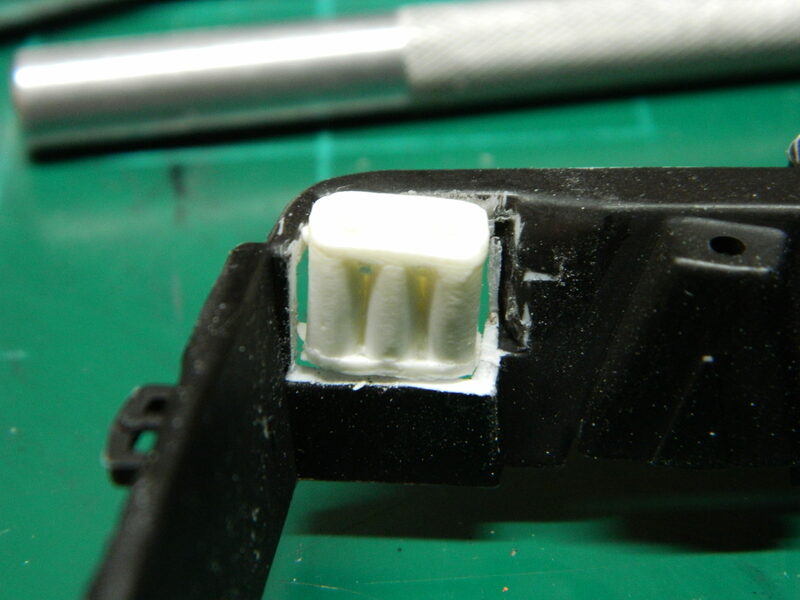 Since the 2 'in 1 kit is still readily available, that would probably be the cheaper (less expensive) route to go. I am not aware of any issues with this kit that you have pointed out. 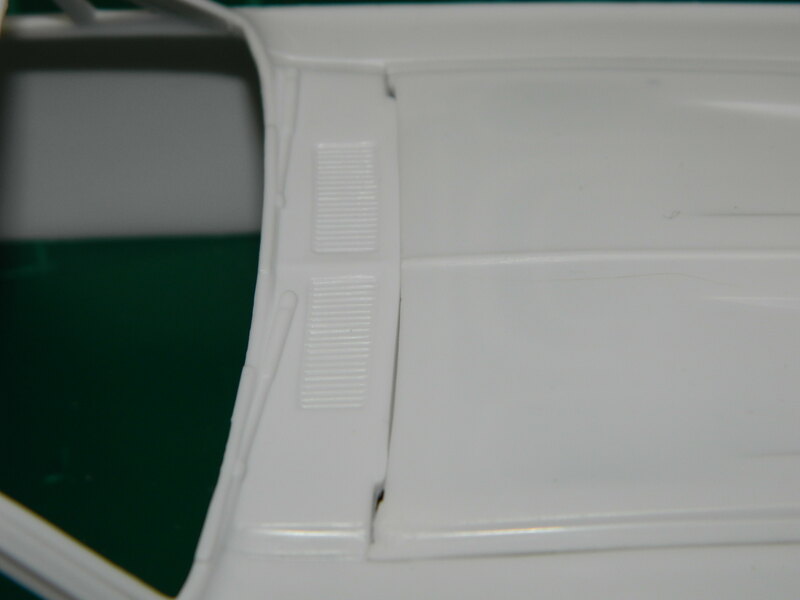 The incorrect wheel arches, hump in the roofline, or interior seat patterns are of no concern to me as I do plan on building the kit anyway-right or wrong. I am one of those type of people that doesn't care if a character line is not prominant enough or if something in out of place. If it looks good when built and it is identified as a specific model, then I did good. If you have a printer, go to Acme License Plate Maker and create you own California plate for the Bullitt Mustang. I resize the image in Microsoft Word and then print it out on photopaper. As far as the magazine is concerned, it is up to you if you want to order that issue of the magazine or not. That is something you'll have to decide for yourself. I thought the article was good and very well planned out. I hope I have answered your questions to your satisfaction. If you have any others, feel free to ask them here or contact me via PM. Good Luck! Thanks a lot for the replies, the heads-up about the 1968-2019 paint difference, and the paint source! I can't wait for my kit to arrive, so that I can start wasting time doing too much brainstorming over it. Csaba, you are quite welcome! This is how information moves, by people talking to one another. The downside is that a lot of information is wrong and shouldn't be forwarded. Even I find myself forwarding infomation based on feelings or what I would like to see, and I have to pull myself back and check my information before I post it. I recently read an older article that was published in Automobile Magazine some time ago and the information contained in that article was wrong. No wonder I don't read that magazine anymore! I am moving forward with my build of the Bullitt Mustang based on my research and what I have discovered by reading articles and looking at photos and yes, watching the movie several times over. This is gonna be great! 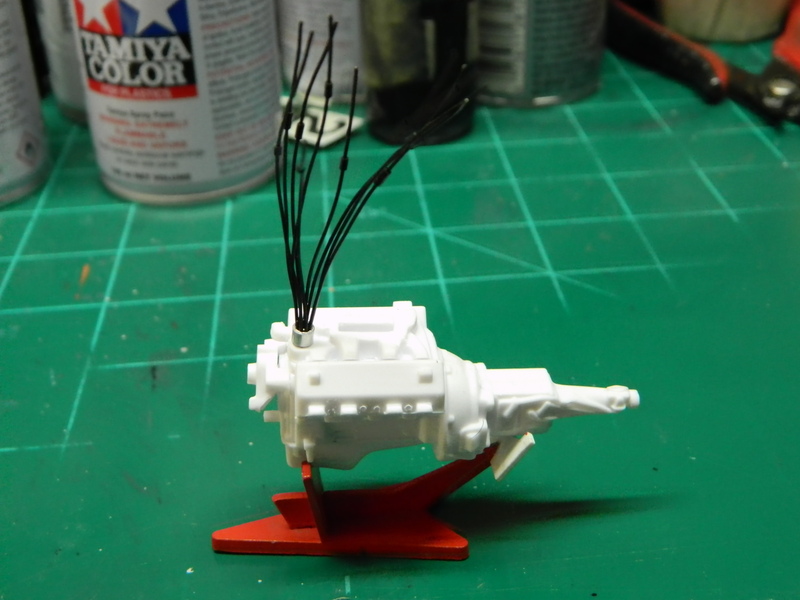 I filled the hole in the engine block and added plug boots to the wired distributor from Parts by Parks. 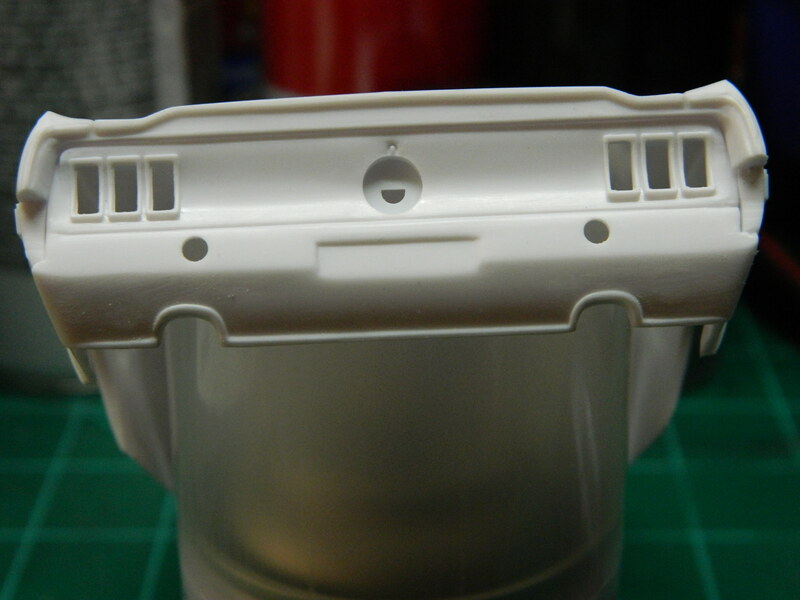 Part of the die-cast molds is the notches on the cowl and the hood. Unless I want to do extra bodywork, which I don't want to, these are staying. There was two raised circles for the backup lights and the Bullitt Mustang doesn't have any. Out came the sanding stick and away went the raised circles. A fellow Club member has a 2 oz. 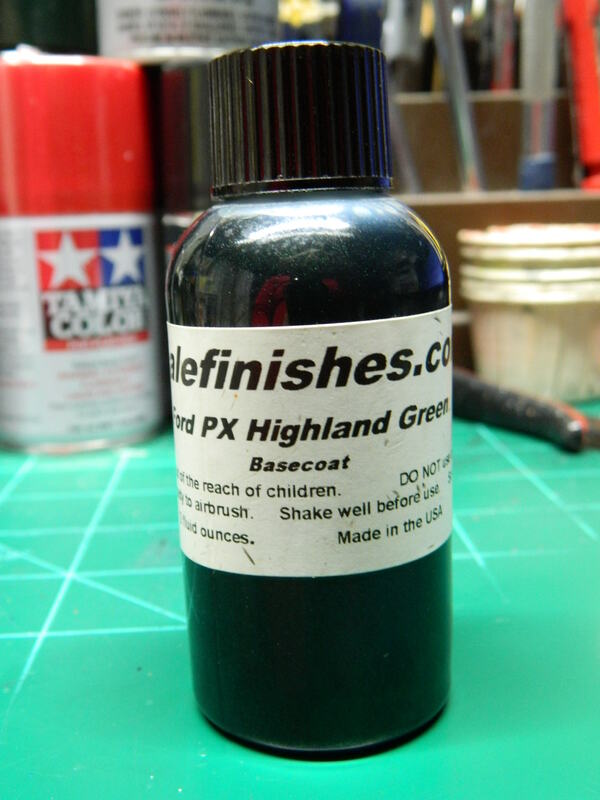 bottle of Ford Highland Green Metallic by ScaleFinishes that he is going to give me. Thanks Joe Angers! I've been picking away at the Bullitt Mustang. I painted the headers flat white, the distributor semi gloss black, the engine block got a second coat of paint, and I made an ignition coil since there is none in the kit. The shifter got a new shifter ball made from a piece of jewelry bead and painted flat white. Now, if I can only find a 4-speed shift pattern decal. There was a set of gauges under the dash and I cut them off since the Bullitt Mustang doesn't have them. 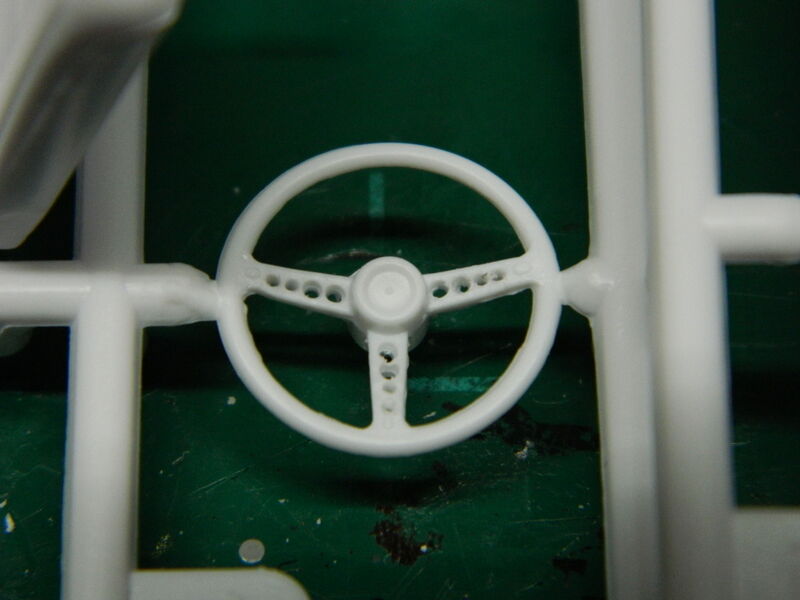 I drilled some holes in the steering wheel spokes and I messed up on some of them. 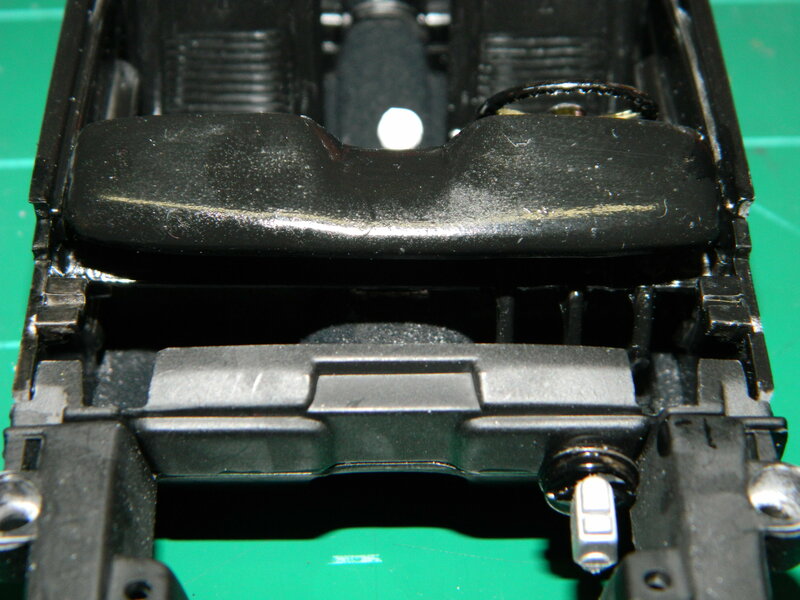 As I was looking at the steering wheel and the mis-guided holes, I remembered that the Revell '68 Mustang kit 2 'n 1 kit has all the extra parts in it for the Bullitt Mustang. 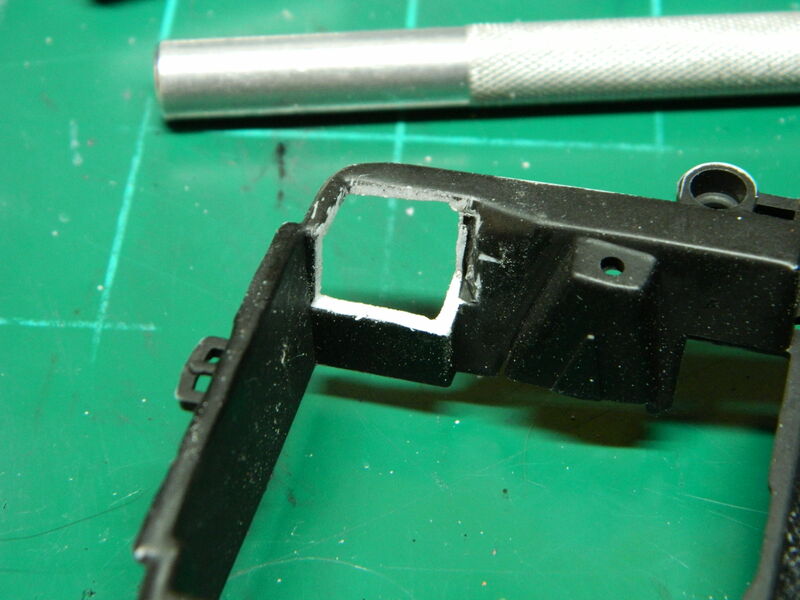 This time I used my magnifier and carefully, well much more carefully, drilled 12 new holes in the steering wheel spokes. Some cleanup and Bob's your uncle! Going great Mike! 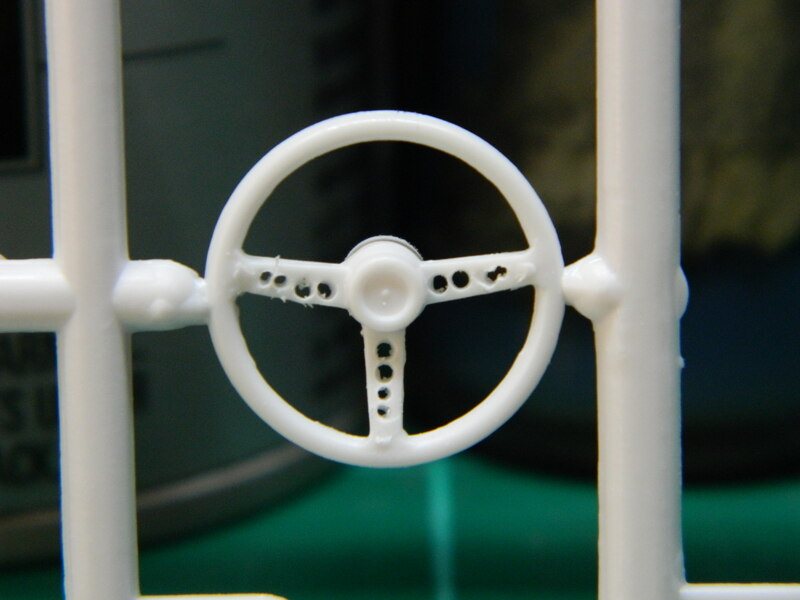 I find that when I decide to correct something like you drilled the steering wheel spokes, I mess up the plastic, and get better results if I remake the part from some scrap metal. The smaller the part, the more this applies. Looks good, Mr Mike! I have the 2008 Bullitt Mustang and it has the same picture of Steve McQueen on the box. Good luck with the paint match! A little progress on my Bullitt Mustang. 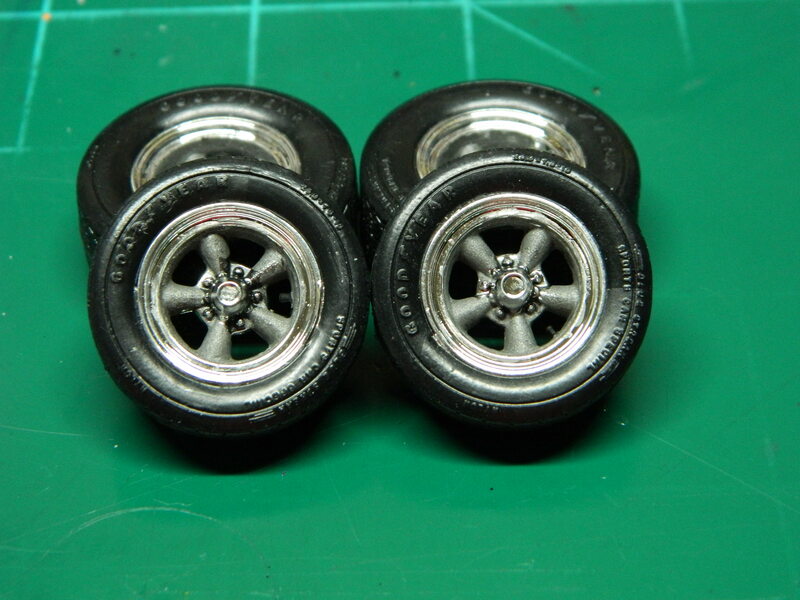 The wheel spokes were painted on the wheels I plan on using for this build. I still need to do some touchups. At last weeks Classic Plastic Model club meeting, I had talked about my plans for this build and Club member Joe Angers offered me his bottle of Highland Green paint from Scalefinishes. Thank you very much Joe! At our last Play Date, my friends Paul, Barry and I were looking at pictures of the "hero" Mustang and we had noticed an Optima battery in the picture of the 390 CID engine. Paul offered me this resin Optima battery. I'll cut out the regular battery, make a new battery shelf and added this resin battery once I get it painted and detailed. I am not familiar with customs requirements for European countries with ebay purchases, so I will say this...first time for everything! 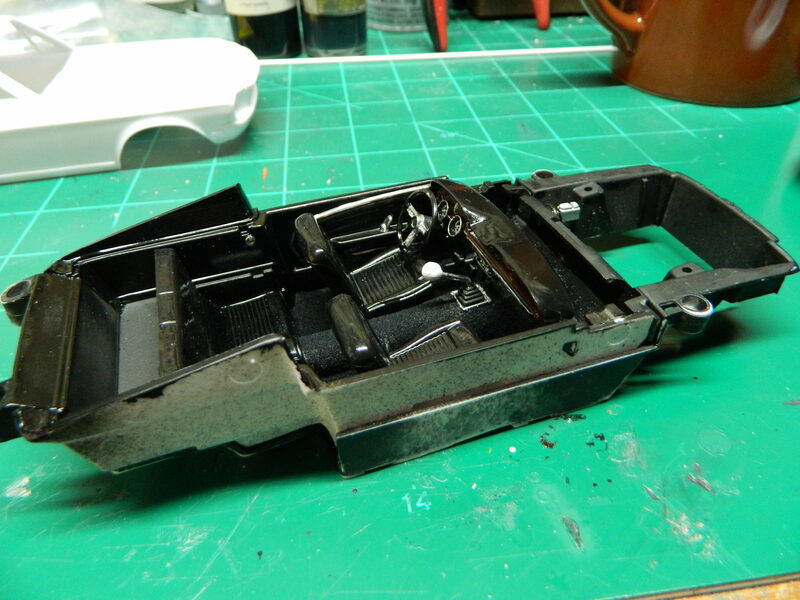 I took the interior apart and got out my photoetch saw and started cutting out the kit battery from the engine compartment. 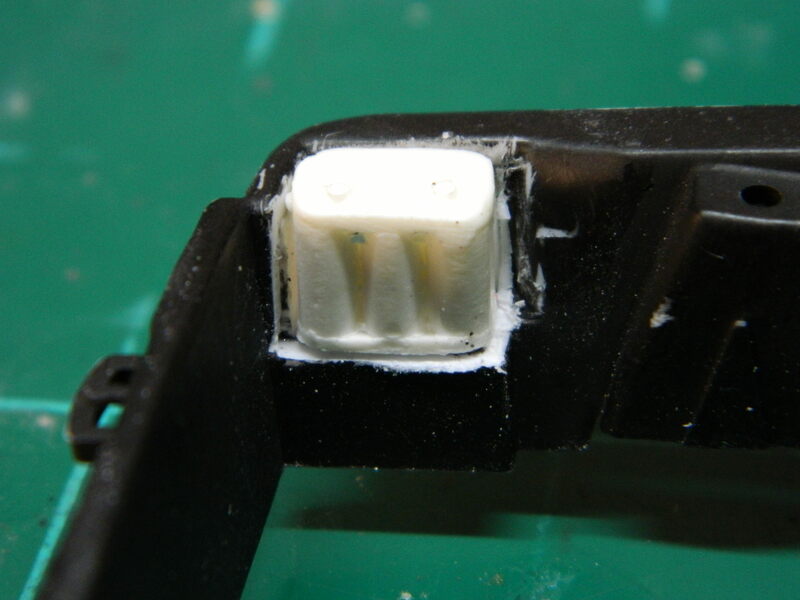 A mockup with the resin Optima battery shows that I need to clean up the battery and maybe remove some more material from the engine compartment and create a new battery shelf. 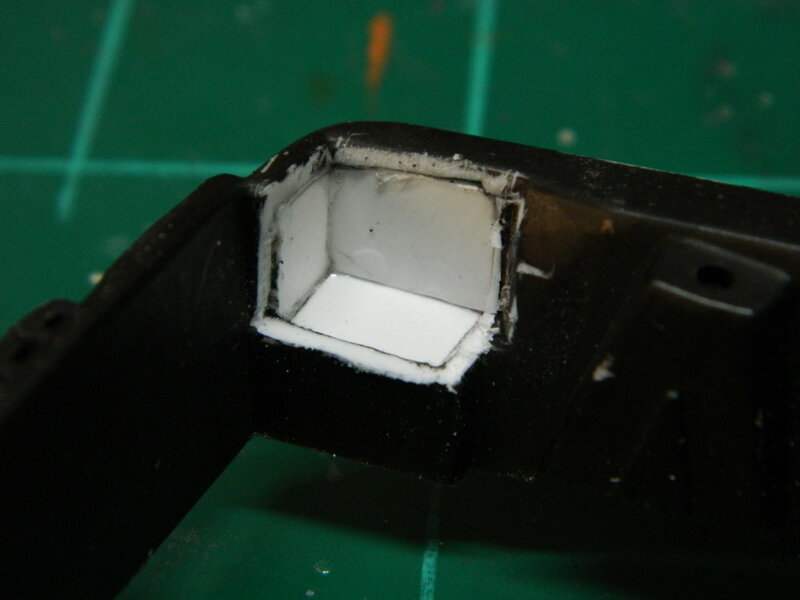 With some careful measuring, I cut some 0.020 styrene into three squares and added them to the hole I had cut into the engine bay. All the pieces were glued with Testors Liquid Cement. I mock up the resin Optima battery and the new battery tray looks perfect. 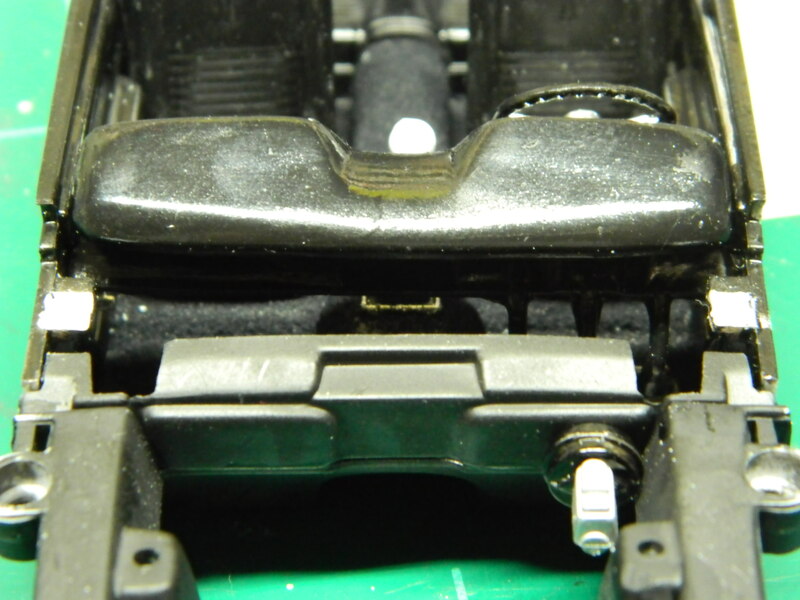 Before someone panics and says that the battery will hit the hood, there is a 1/16" gap that runs between the fender and the engine compartment that is a leftover from the diecast mold. The gap will be filled at a later date. I need to repaint the engine compartment and the new battery tray. 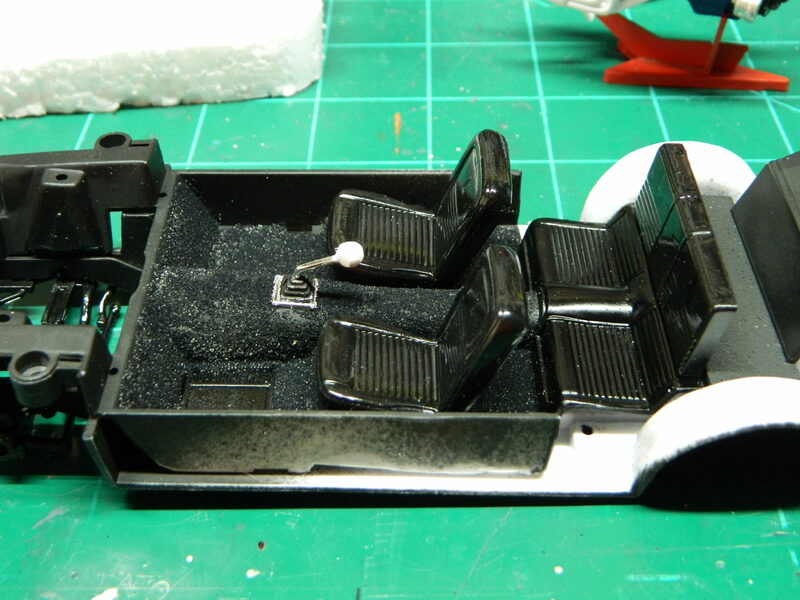 I'm almost finished with the interior, I just need to make some seat belts. A mockup with the body and hood shows the interior not sitting level and the screw holes have some play in them before the are bottomed out. I need to modify the hood pin holders on the side panels to allow the interior to sit correctly. I need to address the rear edge of the hood and the edge of the cowl. This should be even all the way across from one side to the other. 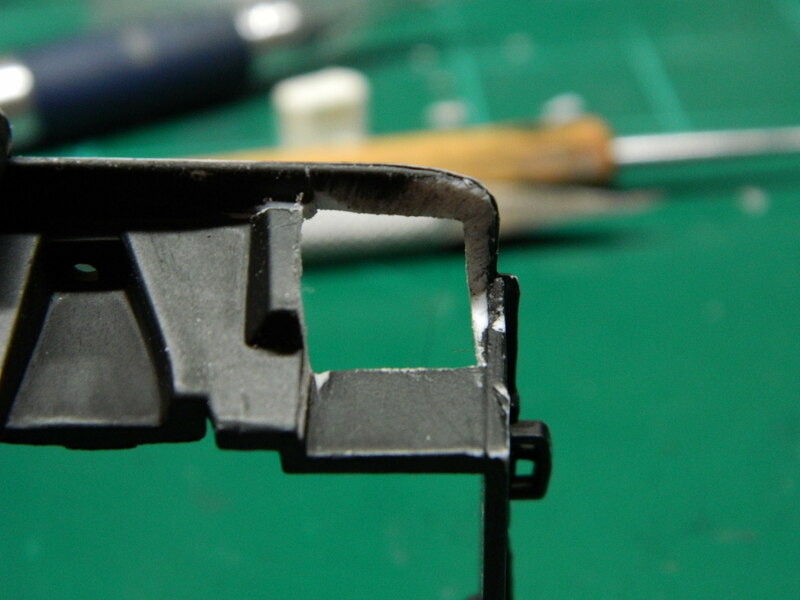 To get the interior to fit better, I removed part of the hood mounts on the interior side panels. 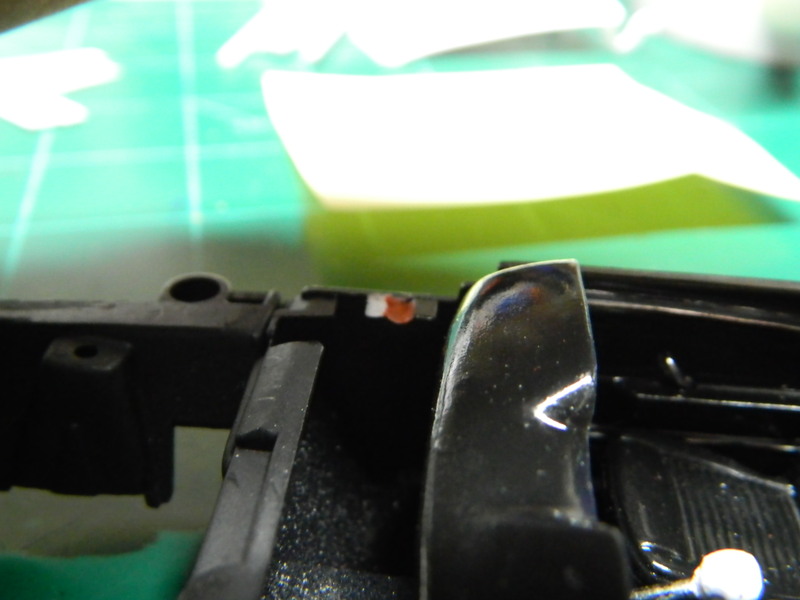 I also deepened the grooves for the hood (highlighted in orange). This is tight enough so the hood now stays up on it own. 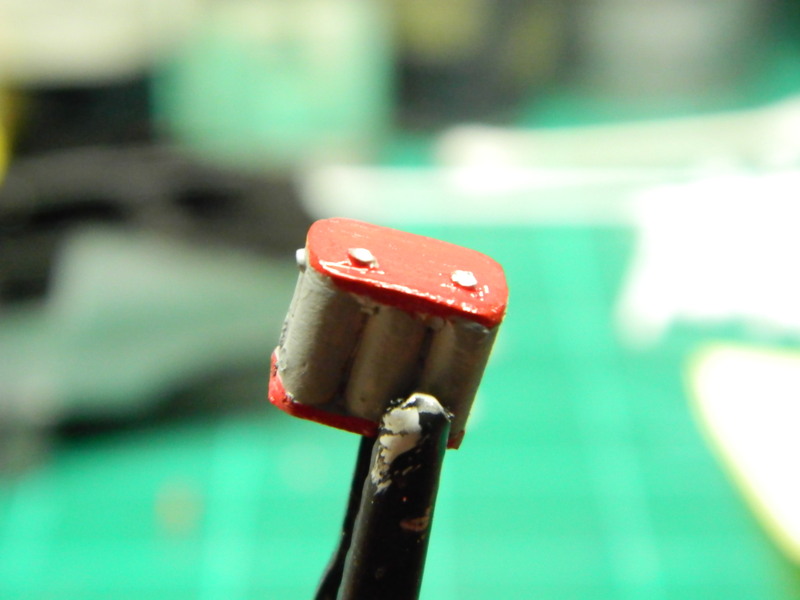 I got the Optima battery painted and now it is ready for the photoetch pieces and mounting. Looks like it takes quite a lot of tweaking to get this model together. Nice! Yes. Some of that tweaking is of my own doing. Replacing some things and such. I could have just thrown this kit together and called it done, but I want it to look a certain way when I am done. I want this to sit like the 1:1 did in the movie and not lowered as the stock kit is. I want everything to sit just as flush and level as I can get it. My influence is the Bullitt Mustang built by Marcos Cruz, but have my touches on it. I have been doing a bit...no...a lot of research on the Bullitt Mustang lately. I even spent some time looking at Google Images for pictures of the Bullitt Mustang for my screen saver and I came across an image that I had forgotten about. 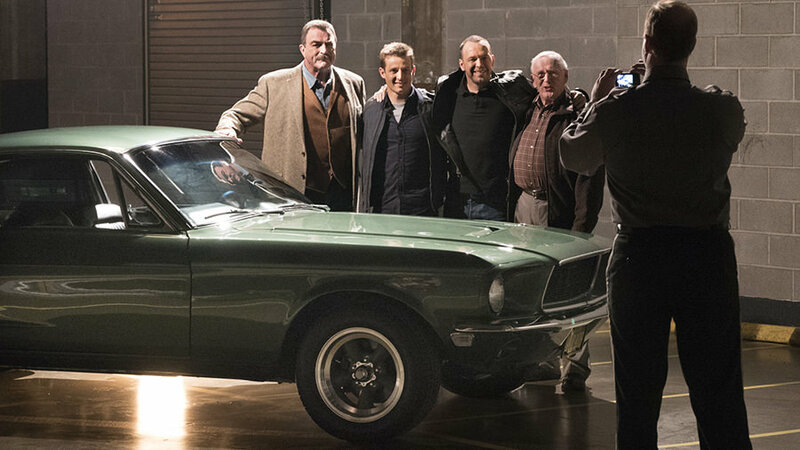 The image came from an episode of the CBS TV drama Blue Bloods starring Tom Selleck. The episode was titled simply enough, The Bullitt Mustang. Season Six, Episode Seven. I have tried to find that episode for free on YouTube and anywhere else and it is only in episode previews or small snippets, but not the complete episode. More research and I found that the complete episode is on NetFlix, but I don't have an account with them. But, my wife does and she has previously told me that I could use it when I wanted. I tubed up the episode and watched it and completely enjoyed watching it. 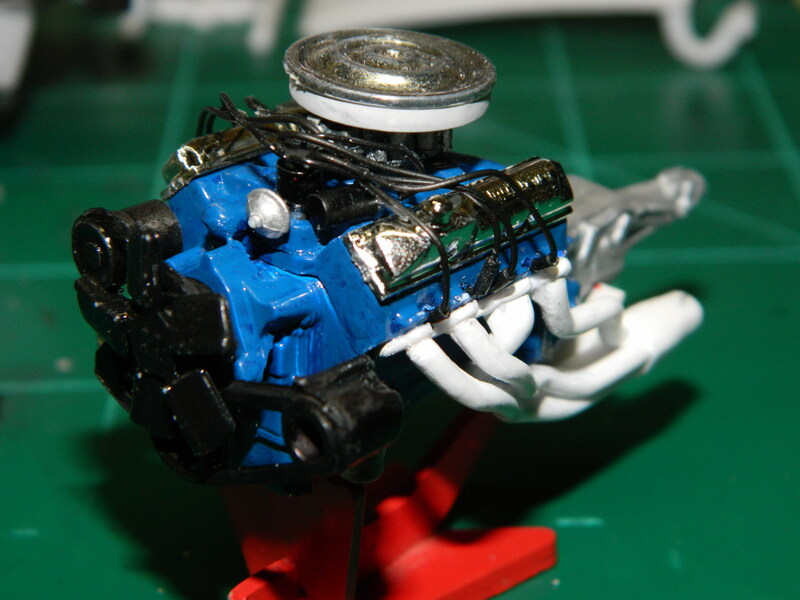 I added some more detail to the 390 CID engine. I may add more. Thank you Steve! I haven't done anything on the Bullitt Mustang lately as I have been working on my other projects that I want to finish first. I should be back working on the Bullitt Mustang very soon. Definitely taking shape very well. Straight shooter with this one... see what I did there lol. Thanks Jeremy! Please! No bad jokes. looking good Im interested in the paint . So am I! As soon as I get my airbrush cleaned out, I'll paint the Bullitt Mustang.